Matt Snider, founder and co-owner of www.FishExplorer.com, is an avid fly fisherman and goes after any fish willing to eat his flies. With tiger muskie, pike, splake, and carp over 30 inches, wiper, walleye, salmon, and trout over 20 inches, largemouth and smallmouth bass over 17 inches, and crappie over 14 inches, Matt claims only to have perfected the persistence needed to succeed in taking warm water species on the fly. Catching every species Colorado has to offer on the fly is one of his many goals. Matt Snider says fly fishing for wipers is like hooking up with a strong saltwater fish only you're in freshwater. Learn Matt's techniques for finding and hooking up with this exciting fish. Conventional tackle started his quest for big fish at a young age, but he soon began converting to the fly rod for bluegill and bass. College years found him fishing rivers for steelhead, St Lawrence Seaway for Muskie, and Lake Cayuga for large browns and landlocked salmon. After graduating, Matt moved to Jackson, WY, where he learned the finer points of fly fishing and tying while working at Orvis. 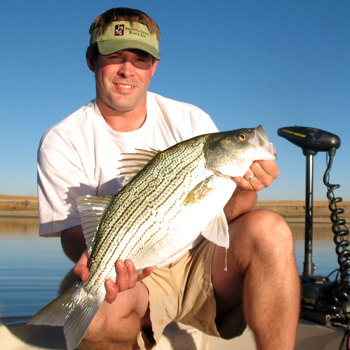 Upon arriving in Fort Collins in 1996, Matt worked at a fly shop where he began his migration towards lakes and warmwater species. Matt holds the state catch-and-release record for splake, and has logged thousands of miles driving across Colorado researching fishing, camping, and boating. Matt appears for sporting shows and regional fishing club meetings to promote and teach the intricacies of fly fishing for warmwater speices. In 2008 Matt was a key presenter at the International Sportsman’s Expo as well as the Larimer County Fishing and Boating Expo. In addition to his writings on the internet, Matt also pens a weekly fishing column in the Fort Collins Coloradoan and dabbles in fishing videos for the internet. across the state. While the website business will take priority, don’t let Matt fool you into thinking he won’t also be out stalking big muskie, pike, wiper, and carp on the fly! For more information on Matt’s fishing insights, visit www.FishExplorer.com, a comprehensive and informative site that features Matt’s blog as well as up-to-date fishing conditions on over 75 lakes in Colorado.